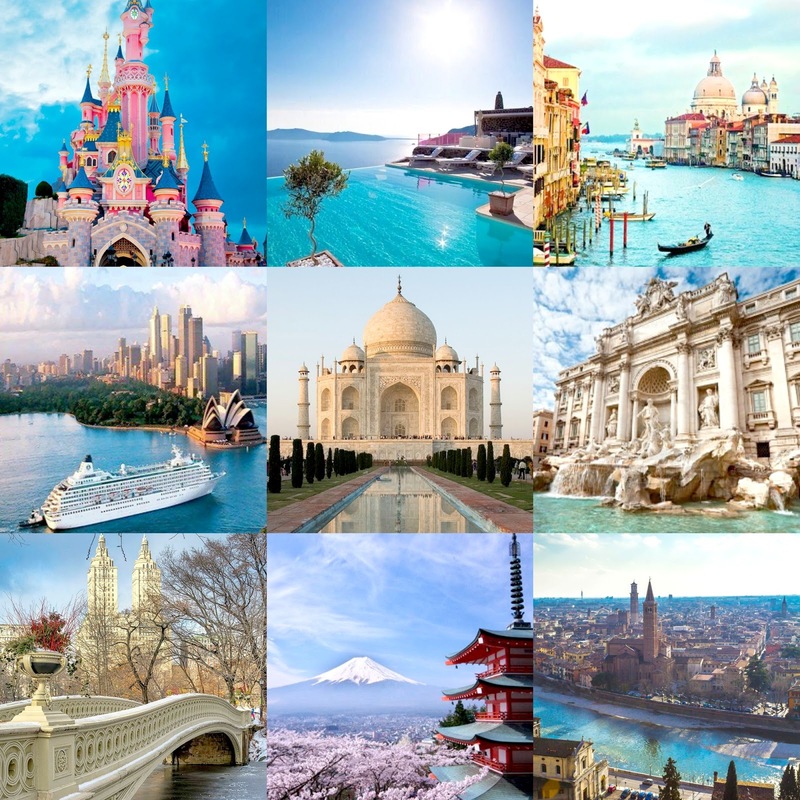 FleurDanielle: Travel Wishlist | Where Would I Love To Visit? HAPPY FRIDAY EVERYONE! Hope you have had a lovely week and are ready for a nice relaxing weekend! Today I thought I would do a little bit of a different blog post for you all. I have been so busy recently with family and friends and I just haven't really had time to properly sit down and write a blog post. Because of this I thought it was a good time to take a small break but I am back now and thought that I would tell you about some of the places in the world I would love to visit. If you have been following my blog for a while then you will know how much I love travelling. After doing a GCSE in travel, then a diploma at college and then a DEGREE at university in tourism I guess it'll come as no surprise to you how much I love it! If you have been following me on pinterest then you will know how obsessed I am with pinning different pictures of beautiful places in the world I'd love to visit. So without me rambling to much here's a short list with reasons why I love each place! Greece is another place I have always wanted to go. It's just so beautiful, however I have been reading a lot about Santorini and it's just such a beautiful place. I know Zoe, Niomi and Tanya, went there last year and after reading their blog posts and seeing all their photos it's just made me want to go even more. Maybe next year I'll finally get to go. It's just a place in the world I just have to see! Sydney is one of those places that means a lot to me and is one of those places I know I have to visit. My Dad lived there for four years when it was in his late 20s, early 30s. I have two step-brothers there who I have never met but who I am desperate to meet and a lot of my favourite TV shows growing up were filmed around Sydney and in Australia in general. I am also obsessed with the Australian accent. It's just a place I know I have to spend some part of my life in. One of the 'new' seven wonders of the world. The Taj Mahal is somewhere that I have been so fond of visiting from a very young age. I have always been fascinated by India and the Indian Culture. My mum is from Mauritius which isn't near India but the way they live and cook and traditions are very similar. I have grown up watching Bollywood films and listening to bollywood music, going to Indian weddings and I have loved it. The Taj Mahal was always mentioned a lot to me growing up. My cousin who lives in Mauritius recently visited it and she absolutely loved it. Another beautiful place in Italy. I just find this fountain so beautiful. I think everything about it from the architecture, to throwing a coin in and making a wish is just so stunning. It also reminds me of the Lizzie Mcguire movie and yes I know the chances of me finding out I'm a doppleganger for a famous celebrity in Italy is very slim (watch the film if you don't understand that reference) but that's really what introduced me to this part of the world. Now if you follow me on twitter or know me in real life then you will know how desperate I am to go to New York in general. I just absolutely love everything about it. I'm a city girl at heart so any city in the world is somewhere I know I must visit but New York or the 'Big Apple' as some may call it is definitely number one on my list and always has been. Central Park is massive and I just would love to take a nice stroll through it, I know we have Hyde Park here in London but it's just not the same and I'd love to see if it's like what you see in movies. I just have to visit New York. It's not even a case of wanting to anymore. I HAVE GOT to go! So here are a few places that I want to visit in the world. There are much, much more believe me but for now I'll leave you with this short list. If you would like me to do more of these types of posts then let me know in the comments below and I will definitely take your suggestion on board! I love writing these as I love letting you guys know more about me! Let me know in the comments below too if you have been to any of these places! I promise to not turn green with envy! Our tastes are very similar! I really want to go to Central Park in New York - it looks amazing! I went to Rome a couple of years ago and the fountain is amazing! No words can describe it - when the sun hits the coins and it looks all sparkly and shiny - really is beautiful! We do a fair few breaks. Our favorites from the last year have Basel on the swiss/German border and a trip we did to Belgium staying in Ypres..On the list for the coming year are Copenhagen, More of Switzerland..probably Bern and Boston/new England in the fall. We best get saving for that one.